Thank you so much for your raffles :) Hope you have a great day! Tambem queria saber como participar do sorteio ????? how to entry in the raffle ? when you will add me in friends in steam and pay me back my win? I want the bonk strange but.. I need luck..
You won my raffle, 2 days left to claim it. Dear Strongbad, can you draw a dragon? We're you talking to me? BURNIN8TIN' TEH COUNTRYSIDE, BURNIN8TIN' ALL TEH PEASENTS! I've only found 12, but that was one hell of an experience. Nice job organizing all of this! And here's the first and only hint for 21st raffle:  is for #0. Congrats on winning my raffle! 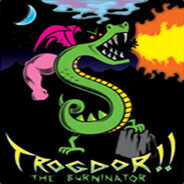 TROGDOR WAS A MAN. I MEAN, HE WAS A DRAGON MAN. MAYBE HE WAS JUST A DRAGON.... BUT HE WAS STILL TROGDOOOORRR!